Will Dark Horse Publish Star Wars Comics Again? In a press release that came out on Monday, Dark Horse Comics announced they are teaming with Disney on a Frozen mini-series. Frozen comics have been published by Joe Books and IDW has a license to publish comics based on other Disney characters. The press release also mentioned that Dark Horse and Disney will be collaborating on more comics in the near future. Needless to say, there are some Star Wars comic fans who are speculating that Dark Horse might get the Star Wars license back. I'm of the opinion that this is not likely since the Star Wars books are some of Marvel's best selling, with the main Star Wars title Marvel's top selling ongoing comic since it debuted in January 2015. It is hard to imagine a scenario where Marvel would jeopardize their monthly sales by giving up what has proven to be a cash cow for them. And, as IDW has discovered with the Star Wars Adventures title, just because a comic is based on Star Wars, it doesn't necessarily translate to high sales. To read more about the announcement, please read the Newsarama article Disney's FROZEN Coming to DARK HORSE As Part Of New Partnership. The Dutch magazine Pep began publication in 1962 and it initially included imported material from the United States and Belgium. In the mid 1960s however, this anthology magazine began featuring more local talent and is responsible for launching some of the longer lasting, well known Dutch comics, including Martin Lodewijk's Agent 327 and Peter de Smet's De Generaal. One comic strip in the magazine created by Dutch artist Uco Egmond in 1973 is Eppo, named after the strip's main character. When the Pep magazine merged with another anthology comic magazine Sjors in 1975, the new publication was named Eppo after Egmond's strip. 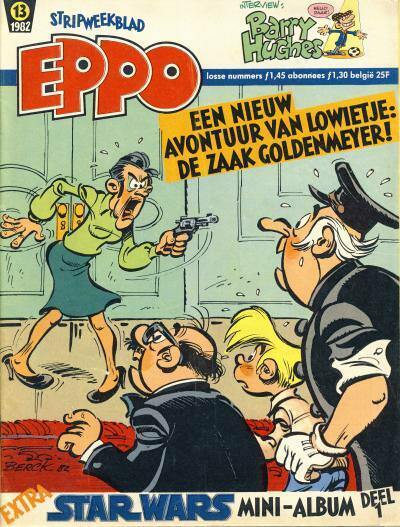 The Eppo magazine continued to publish the Agent 327 and De Generaal comics, but they were joined by equally popular comics like Henk Kuijpers' Franka, Jan Steeman and Andrew Brandt's Roel Dijkstra, and Don Lawrence's Storm. Eppo was published weekly and the numbering was restarted every year. 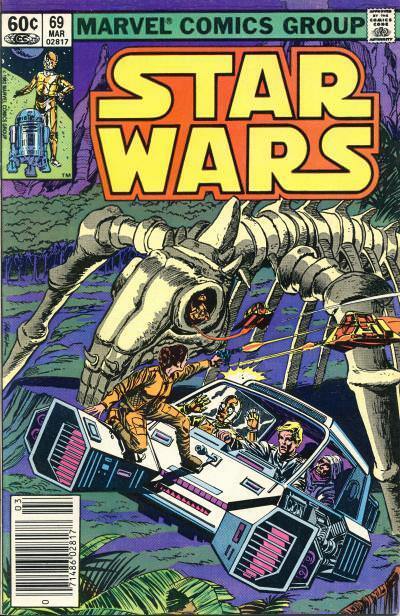 Issue #13 and 14 in 1982 contains 8-page Star Wars comic strip supplements. The black and white supplements are stapled to the center of the magazine and are slightly smaller than the magazine's dimensions of 8" x 10 1/2". The supplements feature The Bounty Hunter of Ord Mantell story. Eppo #13 contains material found in the strip from March 1st to March 22nd and Issue #14 contains material from March 23rd to April 19th. The comic strip is edited to fit in the 8-page format. The cover of Eppo #13 features Berck's comic strip Lowietje. A blurb on the cover reads Extra Star Wars Mini-Album Deel 1 or Extra Star Wars Mini Album Part 1. 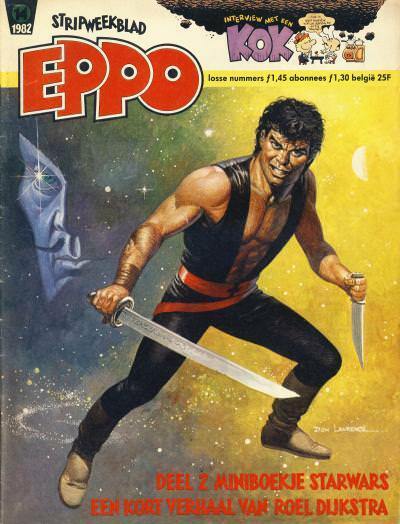 Don Lawrence's Storm is featured on the cover of Eppo #14. A blurb on the cover reads Deel 2 Miniboekje Star Wars or Part 2 Mini Booklet Star Wars. There are other issues of Eppo that contain Star Wars comics. Steam Wars: Gearjammer #1 collects the backup stories from Steam Wars: First Empire #1 and 2 starring the pilot Zora Gearjammer. In the story, Zora Gearjammer, flying a craft with features reminiscent of an X-Wing Fighter, is being chased by another ship commanded by Darq Maude who Zora refers to as the Night Hag. The ship Maude is commanding has solar panels not unlike those found on an Advanced TIE Fighter, although her spacecraft is considerably larger. The pursuit is low over a planet's surface and the two ships enter into a cave with imagery that reminds readers of the Death Star trench run at the end of a New Hope. When the ships emerge from the cave, Maude's spacecraft is grabbed by a Sand Kraken. Before the ship is completely destroyed, Maude gets off a final shot that hits Zora's starship, causing her to crash. Zora is awaken by a voice that tells her "You must fulfill your destiny." She sees a light from the wreckage of Darq Maude's ship and discovers a Star Ember which she plans on using to power her escape. Steam Wars purposely uses familiar Star Wars elements in a Steam Punk setting. It is obvious that Zora Gearjammer is meant to remind us of Luke Skywalker, and the voice Zora hears is like Luke Skywalker hearing Ben Kenobi's voice. Additionally, Darq Maude's name and look is not unlike that of Darth Vader. 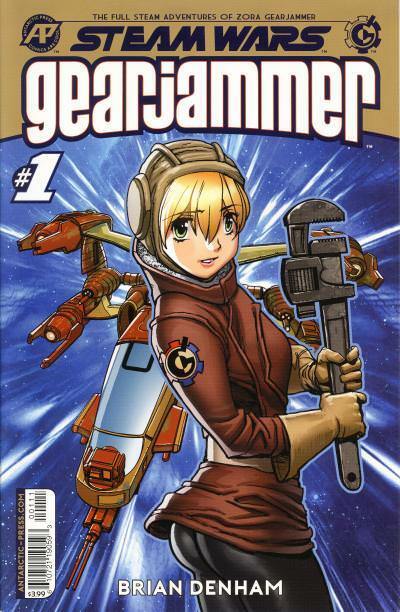 The cover for GearJammer #1 shows Zora Gearjammer holding a wrench. Behind her is the spacecraft which has similarities to an X-Wing Fighter with an elongated body and double wings located at the back. "Luke... the Force runs strong in your family. Pass on what you have learned. Luke... there is... another Sk... ky... walker..." - Yoda's dying words. In The Force Awakens and The Last Jedi, we learn Luke Skywalker was passing on what he had learned, at least until Luke's fateful confrontation with one of his Jedi apprentices, the son of Han Solo and Princess Leia, Ben Solo. The confrontation led to Ben, now Kylo Ren, destroying Luke's Jedi temple and killing many of the other students. Before a future generation of Jedi was hinted at in the new movies, the Expanded Universe had gone their first. Published in March 1994, Jedi Search is the first of three novel about the Jedi Academy written by Kevin Anderson. The second novel, Dark Apprentice, was published in July 1994 and the final novel, Champions of the Force, was published in September 1994. The following year, Kevin Anderson and his wife Rebecca Moesta would continue writing about the Jedi Academy in a series of fourteen books under the Young Jedi Knights title. 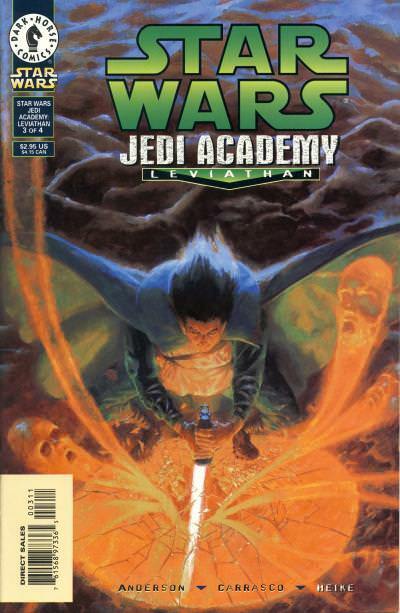 The first 3 books in the Jedi Academy Trilogy focused on the foundation of the Jedi Academy on Yavin 4 by Luke Skywalker, while the Young Jedi Knights series follows the adventures of Han Solo and Princess Leia's twin children, Jacen and Jaina Solo, while attending the established Jedi Academy. 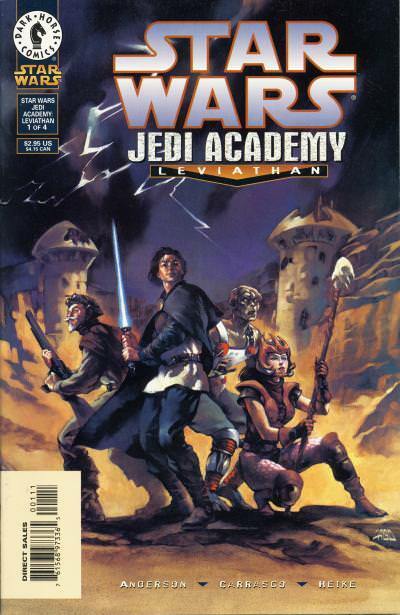 After writing the final novel in the Young Jedi Knights series, Kevin Anderson wrote the 4-part mini-series, Jedi Academy - Leviathan, which stars five of the original students from the Jedi Academy Trilogy. The five students featured in the mini-series are Kyp Durron, Streen, Kirana Ti, Tionne, and Dorsk 81's clone Dorsk 82. (Technically, Dorsk 81 was in the Jedi Academy Trilogy and Dorsk 82 is a different character.) Of the five characters, Kyp Durron has been the most popular and most used, so it is not surprising he takes center stage in this series. The series sees four of the Jedi Knights travel to the planet Corbos to confront a Leviathan that killed all the inhabitants of a mining colony. The first Leviathan is defeated in issue #3 only for a larger Leviathan to attack the Jedi Knights in issue #4. Ultimately this larger Leviathan is defeated. 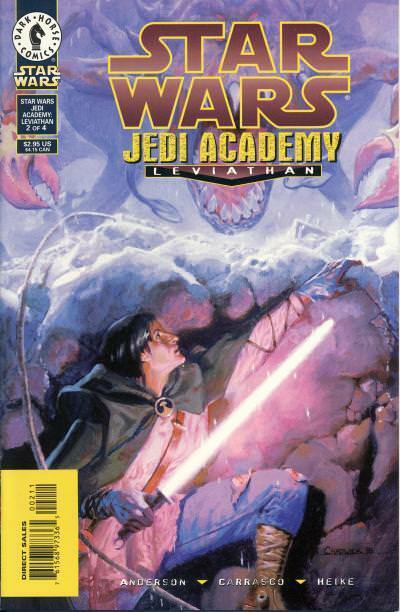 The cover for Jedi Academy - Leviathan #1 shows the four Jedi Knights who travel to the planet Corbos. Front and center is Kyp Durron, while to his right is Streen. Crouched at Kyp's left is Kirana Ti and behind her is Dorsk 82. The second cover shows Kyp Durron being attacked by the Leviathan. Kyp Durron is freeing the souls of the miners from the defeated Leviathan on the third cover. The final cover has all four Jedi Knights in action against the larger Leviathan. 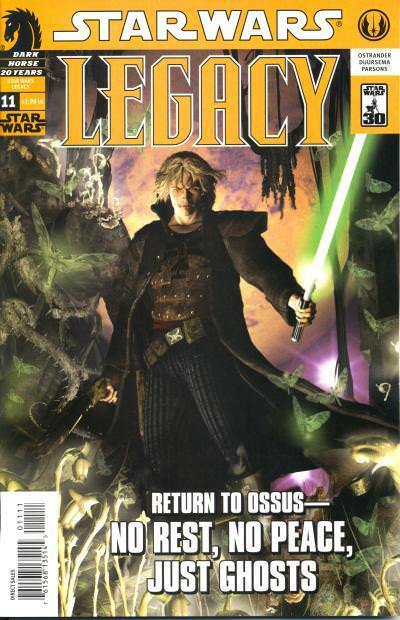 Star Wars: Jedi Academy - Leviathan #1 was the top selling Star Wars comic in October 1998 with an estimated 30,000+ initial units sold. When the series ended in January 1999, it was the lowest selling Star Wars comic for the month with just under 27,000 initial units sold. Despite being the lowest selling Star Wars title, it still was a top 100 comic for the month. It isn't clear why Dark Horse never published any more Jedi Academy stories, since the concept seems like it would be a great source for stories. 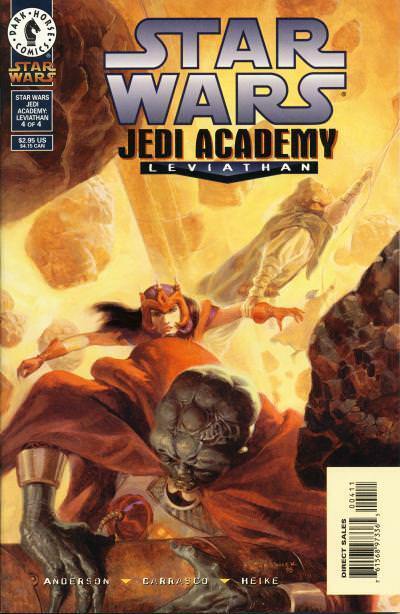 Unfortunately, Kevin Anderson, who also wrote several Tales of the Jedi mini-series, never wrote another Star Wars story for Dark Horse after Jedi Academy - Leviathan. Tercüman Çocuk or Interpreter Child is a weekly magazine from Turkey which features comics, puzzles, and games for children. Starting in early 1982, several issues of the Marvel Star Wars title were translated into Turkish for the publication. Only a few Star Wars pages are included in Tercüman Çocuk and some of the issues even have a Star Wars cover. 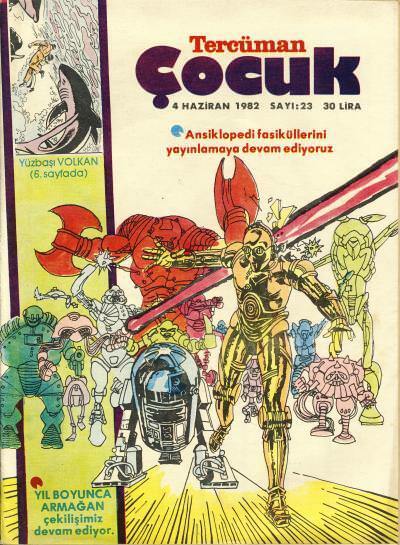 Tercüman Çocuk #23 from June 4, 1982 contains three pages from Star War #24. 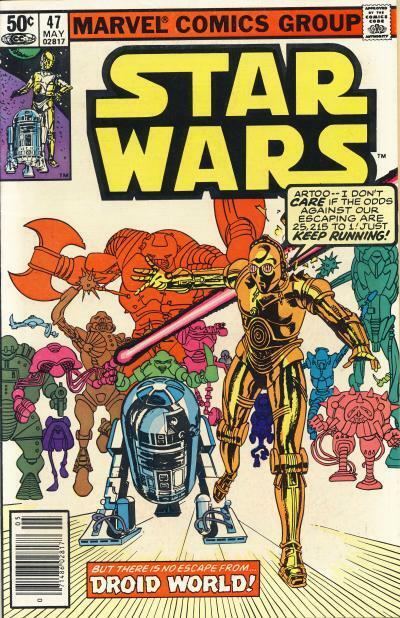 The cover artwork used for the 1982 Tercüman Çocuk #24 is the same artwork used for Star Wars #47. Inside, the color palette is limited and the colors do not match the colors used in the U.S. edition. 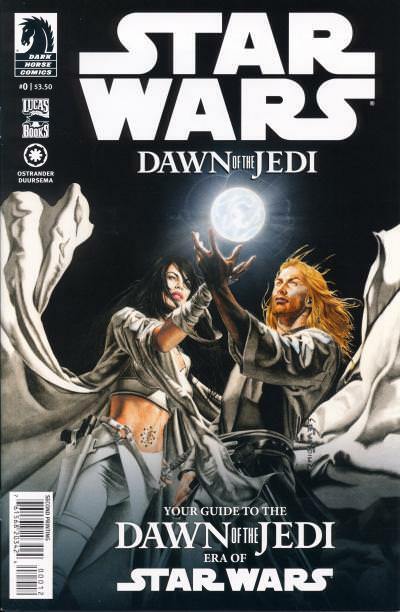 As the cover of Dawn of the Jedi #0 states, it is not really a comic so much as it is a guide to the comic. This guide uses prose and artwork to explain the backstory for the comic. Dawn of the Jedi explores the Star Wars universe 25,000 years before A New Hope. It tells the story of the ancestors of force-sensitive beings who were gathered from around the galaxy and brought to the planet Tython in massive pyramid-like spacecraft called Tho Yors. Over generations other planets in the Tython system are inhabited by non-force sensitives, while those who are attune to the force remain on their home world of Tython. These Je'daii eventually evolve into the Jedi and the Sith. In addition to the history, key locations, beings, and technology are introduced so readers of the comic have a foundation for the stories that will be told. 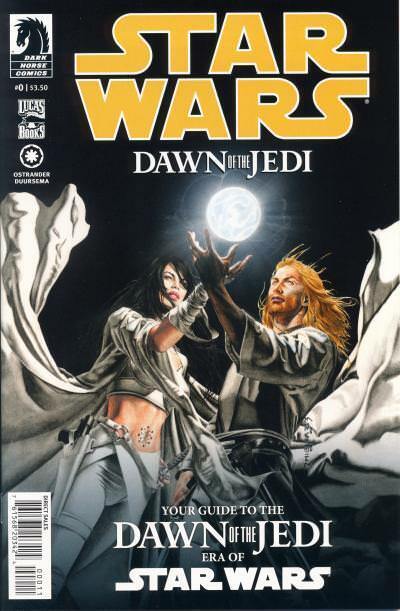 The standard cover shows a female and a male, presumably force-sensitive, with a glowing globe. Neither character has anything to do with the story. The Star Wars title is yellow. Dawn of the Jedi #0 went back to print twice. The second print uses the same artwork as the first print's cover, except Star Wars in the title is all white and the UPC box clearly states it is a second print. The third print has all new cover artwork showing one of the Tho Yor spacecraft. The UPC box clearly states it is a third print. In 2016, Loot Crate had over 600,000 subscribers for its myriad of offerings. Monthly, Loot Crate ships a variety of themed boxes packed with pop culture goods. Some of the monthly offerings are specific to a brand, like Halo, Call of Duty, Marvel, or Star Trek. 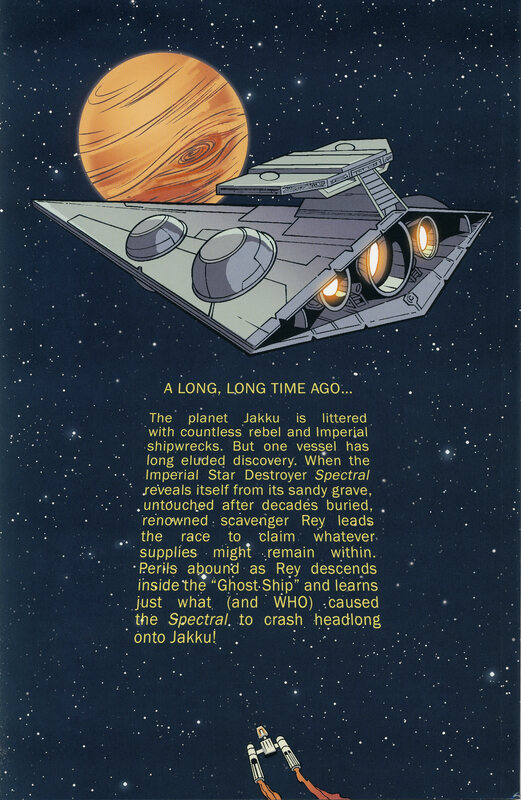 In December, their standard box was themed Explore and contained an exclusive Star Wars comic from IDW, Star Wars Adventures: Destroyer Down. This is not just an exclusive cover; the entire comic is exclusive to the Loot Crate box. The 60-page prestige bound comic focuses on Rey, one of the main characters featured in The Last Jedi released to theaters the same month. When Marvel's Star Wars #1 shipped in January 2015, it was estimated over 250,000 Loot Crate exclusive covers were sent out. It is probably safe to say Star Wars Adventures: Destroyer Down has more printed copies than even Star Wars Adventures #1 which had estimated sales of approximately 50,000 initial units sold in September. Compared to the sales for December's Star Wars Adventures #5 which came to just under 14,000 estimated initial units sold, it is easy to see why getting a comic distributed by Loot Crate is advantageous to IDW. As expected, there are ample copies of this comic available on eBay. While prices vary wildly, I would not pay more than $15 shipped for this comic due to the number of copies available compared to the demand for the title. The Smurfs or Les Schtroumpfts were created by the comic artist Peyo for Belgian readers in 1958. Originally introduced in another series Johan and Peewit or Johan et Pirlouit in the Spirou comic magazine, the characters received their own stories starting in 1959. The comic proved popular and spread throughout Europe. The property was brought to the United States as a Saturday-morning cartoon in 1981. The cartoon was a big hit and aired until 1989. During the time the Smurfs were on television, several rip offs were created, including the Snorks and, alas, the Ewoks. The similarities between the Smurfs and Ewoks are numerous, including both centering around a village in the forest. Papa Smurf is the leader of his community while Chief Chirpa leads his. The Smurfs only had a few females, the most popular being the first female, Smurfette, who is similar to the Ewoks' Princess Kneesaa. The members of both villages have a special skill that defines their role. Magic plays an important role in both properties and many of the adventures from one could easily be adapted to the other. It is easy to see that the Ewoks cartoon liberally borrowed ideas from the more successful Smurf's show. 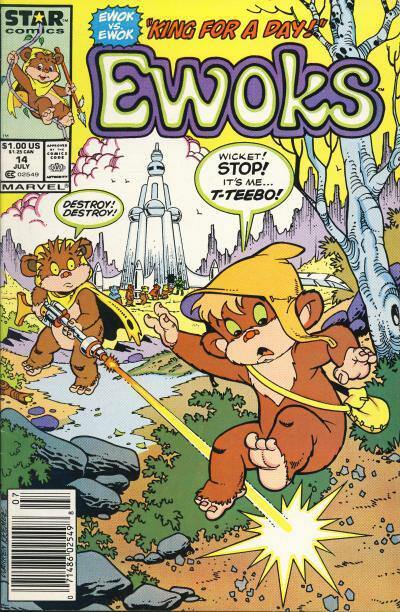 While the Smurfs enjoyed a long run, the Ewoks only lasted two seasons from 1985 to 1986. The Marvel comic series based on the television show ran for 14 issues, with the final issue having a cover date of July 1987. December is the fourth month where there are two different publishers of ongoing Star Wars titles, Marvel and IDW. I will analyze the numbers from both publishers separately. Comichron released the December 2017 estimated sales today and 2017 sales for all comics finished the year down by 10%. Marvel improved in December with 4 titles placing in the top 10 with Phoenix Resurrection: The Return of Jean Grey #1 leading the way in 3rd place. DC's Doomsday Clock #2 was in 1st place like the previous month. Amazing Spider-Man #793 placed 10th edged out Star Wars #40 in 11th. We'll see next month if Star Wars is still Marvel's top selling ongoing title or if the Spider-Man #793 bump is permanent and not due to the Venom Inc. event. As expected, Star Wars #40 did rebound from the previous issues sale of 56,125 units sold adding almost 5,000 units. Last month's double shipping did not impact the long term sales of the title. The remaining ongoing titles, Darth Vader, Doctor Aphra, and Poe Dameron, all saw modest decreases. 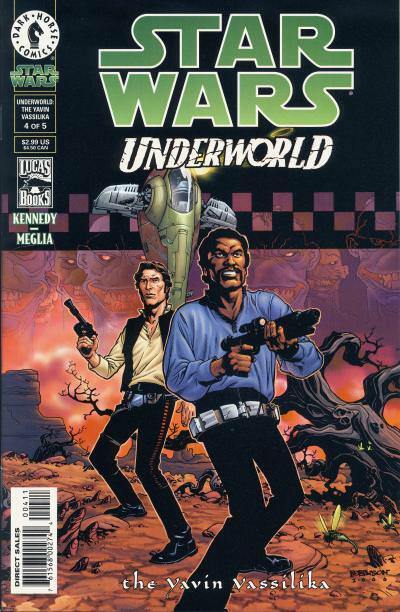 The final issue of Jedi Republic - Mace Windu mini-series saw unit sales little changed from the previous issue. The Vader Down and Screaming Citadel one-shots do not tie-in to a movie and are the first issue of an event that cross over into several titles, so we can dismiss those numbers as outliers. Additionally, Droids Unplugged also does not tie-in to a movie and consists of reprints. The C-3PO and Rogue One specials however are movie tie-ins. While Storms of Crait did not achieve the same lofty sales as the C-3PO special, it did do better than the Rogue One special. I'm expecting the DJ one-shot in January to sell about the same as the Rogue One special one-shot. The average sale per issue of 42,153 would rank 26th on the top 300 chart for the month of December. Marvel's Star Wars trade paperbacks, reprints, and reorders are not accounted for with these numbers. The Star Wars trade paperbacks are strong sellers. Star Wars Adventures fell again in December and has not found its sales level yet. I'm surprised at how low this title has sank with regards to initial units sold. Just from a Star Wars comic collector point of view, many of these issues have an absurdly low number of copies available. 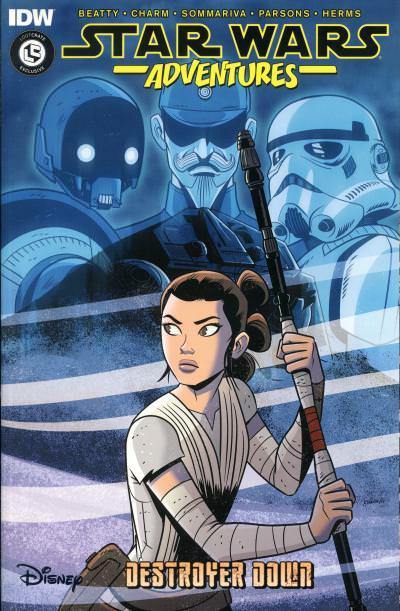 Star Wars Adventures #5 has 3 covers; there are approximately 7,000 copies of the A and B covers and 1,400 copies of the 1:10 ratio retailer incentive cover. (I'm doing a lot of rounding up because we don't know how many copies were published, just how many were sent to comic retailers. My estimates can be wildly off without knowing what the publisher printed.) These numbers are lower than several Star Wars exclusive covers released by Marvel and in the case of the retailer incentive, it has a population similar to several Marvel 1:100 ratio covers. I would think a collector would pick them up just for the covers and relative rarity alone, even if they didn't enjoy the stories. Take a look at the Star Wars Sales Estimates Charts and please read the blog posting December 2017 estimates online: Diamond expands comics, graphic novel tables to Top 500. November is the third month where there are two different publishers of ongoing Star Wars titles, Marvel and IDW. I will analyze the numbers from both publishers separately. Comichron released the November 2017 estimated sales in December and the main Star Wars surprisingly cracked the top 10 books for the month. I'm surprised because Marvel has been making a lot of noise about their return to legacy numbering, but apparently, that proved to be a one month blip and not an ongoing bump as I had imagined. Marvel only had two books place in the top 10, Captain America #695 in 8th place and Star Wars #38 in 10th place. The main Star Wars title is Marvel's top selling ongoing title for another month! DC's Doomsday Clock mini-series takes the top 2 places and the Batman one-shots, ongoing, and annual fill out the remaining top 10 positions. IDW's Star Wars Adventures all-age title continued it's tumble in November. The main Star Wars title double shipped in November. The good news is Kieron Gillen's first issue, Star Wars #38, saw an increase in estimated sales of over 12% or 8,000 units. The bad news is issue #39 fell over 24% or 18,000 units. If you look at the average sales of both issues, each sold approximately 65,005 units and, when compared to the previous month's estimated unit sales of 65,606, that is insignificant. But, Star Wars #38 used a variant, incentive, and exclusive cover to help boost sales. I questions whether or not that practice is good for long term sales or not. Where this can be a problem is if sales for Star Wars #40 do not rebound from the 56,125 units sold for issue #39. We will know in a few short days when the numbers for December are available. The Darth Vader title also double shipped. Darth Vader #7 sees the start of a new arc starring Jocasta Nu, the librarian from the Jedi Temple in the prequel movies. Darth Vader #7 saw another 5% drop in estimated units sold and Darth Vader #8 sold approximately the same number of units. The ongoing Doctor Aphra and Poe Dameron both continue to slowly bleed sales this month. Looking back 6 months, Doctor Aphra has lost about 10,000 unit sales and Poe Dameron has lost about 3,000 unit sales. Rumor is the ongoing Poe Dameron title may be ending with issue #24 to be replaced by another title. Considering Poe Dameron sells better than many Marvel superhero titles and Poe Dameron has been fairly consistent in its sales, I'm not convinced it makes sense to end the title. Jedi Republic - Mace Windu #4 continues to bleed buyers with only one more issue left to this mini-series. The average sale per issue of 47,214 would rank 36th on the top 300 chart for the month of November. Marvel's Star Wars trade paperbacks, reprints, and reorders are not accounted for with these numbers. The Star Wars trade paperbacks are strong sellers. Star Wars Adventures tumbled again in November, losing nearly 1/3rd of the sales from the previous month. IDW's next best selling issue is Teenage Mutant Ninja Turtles/Ghostbuster II #1 with 12,787 estimated unit sales and Teenage Mutant Ninja Turtles #76 is very close behind with 12,258 unit sales. The Teenage Mutant Ninja Turtles brand has been very important to IDW and they have published more issues of the ongoing title than any other publisher including Archie. Can Star Wars be just as important to IDW with Marvel also publishing titles at the same time? Star Wars Adventures #4 has unit sales in line with Dark Horse's Star Wars line at the end. These numbers are pretty typical for Dark Horse going back for several years prior to their final month of publishing. I would think IDW will be happy with sales of their main Star Wars title, so long as those sales remain at or above those of Teenage Mutant Ninja Turtles, but it isn't clear if that will be the case. IDW is publishing several one-shots in January 2018 based on the Forces of Destiny sub-brand. I expect we will see sales in the 15,000 - 25,000 range for these one-shots. IDW might need to experiment like Dark Horse did when they first acquired the Star Wars license. An anthology title might not be the best indicator of potential sales; they should try putting out ongoing titles featuring specific characters to see if anything sticks. Since they seem willing and able to publish stories based on characters from the new movies, it might make sense for them to publish an ongoing title based on them. Take a look at the Star Wars Sales Estimates Charts and please read the blog posting November 2017 Comics Order Estimates: Doomsday Clock #1 near 239k copies. October is only the second month where there are two different publishers of ongoing Star Wars titles, Marvel and IDW. I will analyze the numbers from both publishers separately. Comichron released the October 2017 estimated sales in November and there was no noticeable movement in sales of the Marvel titles. In October, Marvel returned to their original numbering on their superhero books, a gimmick that saw many of the titles place higher than normal on the charts. DC also had many Batman derivative one-shots spinning out of the Dark Nights Metal event. The top selling Marvel book was Mighty Thor #700 in 2nd place and the top selling DC issue was Dark Nights Metal #3 in 1st place. No Star Wars title placed in the top 10 and I expect this to be the case for the foreseeable future. Despite Star Wars #37 coming in 20th place on the chart, it remains Marvel's top selling ongoing title. IDW's Star Wars Adventures all-age title fell out of the top 100 in October. 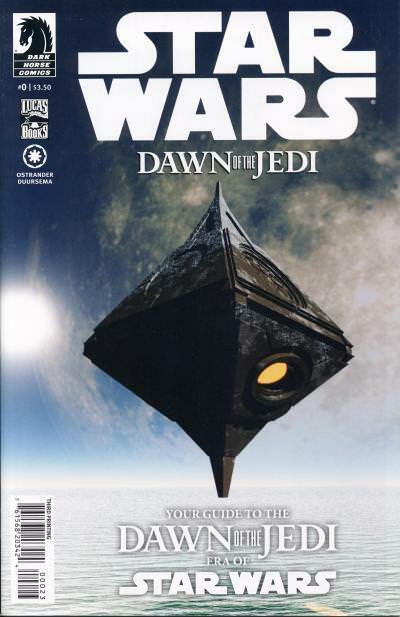 The main Star Wars title saw an insignificant increase for Jason Aaron's final issue. Next month, Kieron Gillen begins writing this title and he is starting things off with The Ashes Of Jedha arc which should see a bump in sales. Darth Vader #6 was the final issue in the inaugural 6 story arc. Despite an appearance by the Inquisitor from the Rebels animated series, the number of initial copies sold was down almost 5%; I was expecting a slight boost in units sold. It appears this title is still trying to find it's sales level. The ongoing Doctor Aphra and Poe Dameron both saw insignificant drops. The Captain Phasma mini-series double shipped again in October and finished with respectable numbers for a mini-series when compared to other comics based on the sequel trilogy. It is clear that, so far, comics based on characters from the new trilogy are not big sellers like comics based on original trilogy characters. Because Disney is being so careful with content surrounding the new movies, it holds back publishers from running with significant stories. A story about how Captain Phasma survived the destruction of Starkiller base is interesting, but apparently not compelling enough to garner more attention. Jedi Republic - Mace Windu is the lowest selling non-movie adaptation mini-series. I feel the artwork on this title has been detrimental to sales. The average sale per issue of 42,739, the lowest so far, would rank 47th on the top 300 chart for the month of October. Marvel's Star Wars trade paperbacks, reprints, and reorders are not accounted for with these numbers. The Star Wars trade paperbacks are strong sellers. Star Wars Adventures fell out of the top 100 comics in October; the third issue shed over 25% of the previous issue's sales. For Marvel, this would no doubt be troubling, but considering IDW's next best selling issue in October is Teenage Mutant Ninja Turtles #75 with 14,855 estimated units sold, I suspect IDW is okay with sales, for now. Take a look at the Star Wars Sales Estimates Charts and please read the blog posting October 2017 comics sales estimates: Metal #3 near 159k copies, four over 100k. 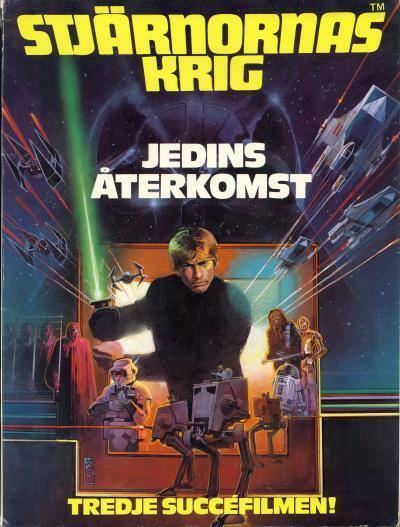 Semic Press' sixth album for Swedish Star Wars comic readers contains the Return of the Jedi adaptation. Jedins Återkomst uses the same cover found on Marvel Super Special #27. 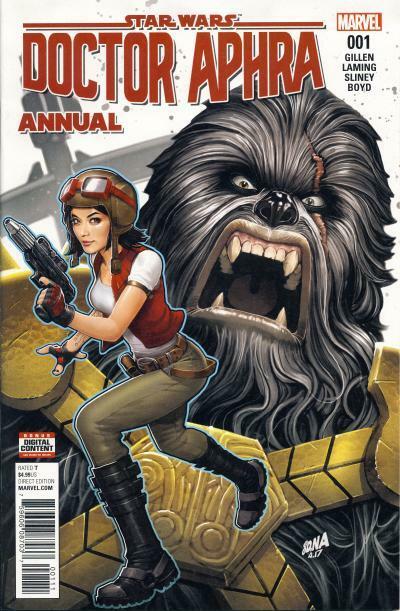 Black Krrsantan, the Wookiee bounty hunter, has his background explored in Doctor Aphra Annual #1. The story begins with a squad of five Trandoshan's slavers hunting Wookiees on Kashyyyk for the Xonti Brothers. They come across an injured Wookiee tied to a tree when they are attacked. Their attacker is Krrsantan who kills four of the slavers and asks the fifth to take him to his employers. This story is being told by the surviving Trandoshan to a pair of reporters named Dixnet Nat and Domthro Rus. Weeks later, the intrigued reporters arrive to interview Krrsantan. 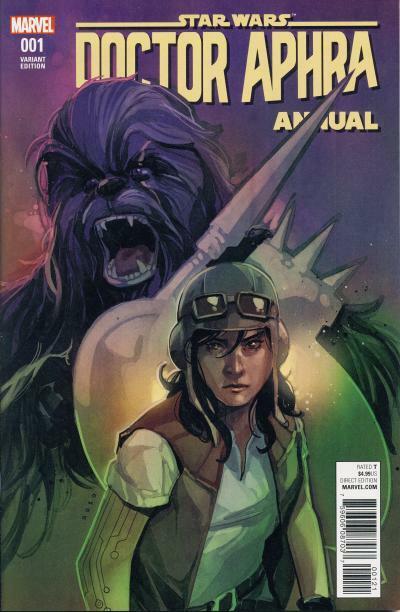 Doctor Aphra pretends to be Krrsantan's agent and Krrsantan continues the story where the slaver left off. Krrsantan volunteered to be taken to the Xonti Brothers, but they enslave him along with others. The Xonti Brothers train and sell slaves to fight in the Pits. The training is brutal and only two of the slaves survive, including Krrsantan. The Xonti Brothers want to give the survivors an edge in the Pits, so Krrsantan undergoes surgery and has metal implanted into his hands making his fists lethal weapons. While Krrsantan is telling his story to the reporters, Aphra, Triple Zero, and BeeTee break into their spacecraft so they can advertise an auction of the ancient Rur artifact on the Undervine network. Krrsantan continues his story and he proves to be a capable fighter and showman in the Pits. Dixnet Nat interrupts Krrsantan and offends him when she questions why he wants revenge on the Xonti Brothers for something he volunteered for. An angry Krrsantan ends the interview and the reporters flee the planet quickly.&nbap; In space, Domthro Rus explains to Dixnet Nat that Krrsantan is not seeking revenge, but instead has a life debt to the Xonti Brothers that he can only repay by changing their lives like they changed his. The pair also learn that they lost their Undervine posting permissions until they show they understand the Undervine network is not for advertising. The story ends with Krrsantan competing in the Pits while Doctor Aphra, Triple Zero, and BeeTee watch. Because the events are being conveyed as stories being told to the reporters, it is entirely possible some or all of the events may not be true. Both the standard cover and the Phil Noto variant are very similar. Princess Leia: And so, to summarize: we've learned that one of the other bounty hunters involved in the trapping of Han Solo was in league with Boba Fett, but was cut out of the reward when Fett took Captain Solo from Cloud City. It seems reasonable, then, to assume that this hunter could be somewhat bitter about the situation, and might be willing-- for a price-- to tell us where Fett is hiding until his redezvous with Jabba the Hutt. We've narrowed our quarry list down to three-- --The cyborg called Dengar-- -- The pursuit droid designated as IG-88-- -- and Bossk, reptilian monarch of the Qotile System. 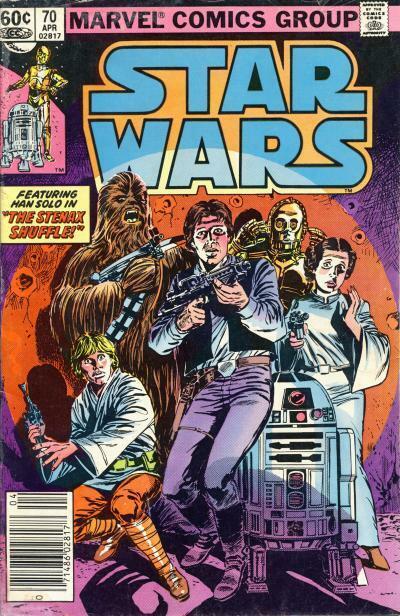 The remainder of issue #67 does not address the issue and the search for Han Solo begins in earnest in Star Wars #68. Return of the Jedi was released to theaters May 1983 and Marvel probably began working on the Return of the Jedi adaptation in late 1982. 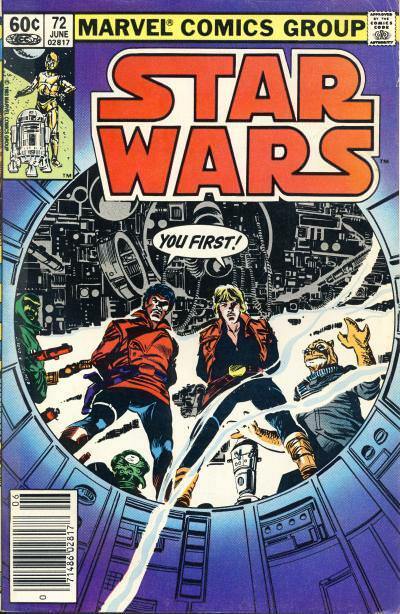 By the time Star Wars #68 was written, Marvel must have known at least the outline for the new movie, including how the capture of Han was going to be dealt with. It makes sense then for Marvel to return to the search they began in issue #46. Star Wars #68 titled The Search Begins is the first of a two-part story that has Princess Leia pursuing one of the bounty hunters, Dengar, on the planet Mandalore. In the story Leia encounters slavers who are being protected by Imperial Stormtroopers and ends up helping and befriending a Mandalorian named Fenn Shysa, who she original thinks is Boba Fett. It turns out Fenn is an old associate of Fett's. Leia asks about Dengar who it turns out Fenn has captured. Leia sends C-3PO to free Dengar while she seduces and incapacitates Fenn. While Leia, C-3PO, and Dengar are escaping Fenn's camp they run into Stormtroopers that Dengar signaled for. In Star Wars #69, Death in the City of Bone!, Leia and C-3PO is taken prisoner and transported to a slave sanctuary made out of the skeleton of some large creature. There she meets Suprema, Emperor Palpatine's chosen ruler of the Mandalorian slave colony. After her brief meeting with Suprema, Leia is escorted to a detention cell, but one of the Stormtroopers is Shysa who frees her. He asks for her help in freeing his friend Tobbi Dala in exchange for Dengar and Leia agrees. After retrieving Tobbi, they capture Dengar, but their escape is blocked. They go to The Suprema's office where Tobbi is wounded and Suprema is knocked out. Tobbi decides to stay behind to allow the others to escape. They do escape, but the slave sanctuary is destroyed in the process, killing Tobbi. Dengar is interrogated, only to find he was not the bounty hunter betrayed by Fett. The story ends with Lando and Chewbacca on The Wheel getting information about Bossk's whereabouts. Star Wars #70, The Stenax Shuffle, shows Lando, Chewbacca, and Luke Skywalker aboard the Millennium Falcon on their way to the planet Stenos, the last known location of Bossk. They recap their mission to find Han and then Luke tells a story about the first time he was on Stenos with Han, Leia, Chewbacca, C-3PO, and R2-D2. It is a nice flashback tale that also has the first appearance of Rik Duel, Dani, and Chihdo. Return to Stenos in Star Wars #71 begins the two-part story of Luke and Lando's pursuit of Bossk and IG-88 on Stenos. Luke and Lando leave Chewbacca and R2-D2 aboard the Falcon while they visit the nearest bar in Stenos' capital city. Lando is recognized by a patron named Drebble who offers a reward for his capture. A firefight breaks out and Luke spots Bossk leaving the bar. Under fire, Luke and Lando escape the bar and we learn IG-88 is also in the establishment. Still being pursued, Luke and Lando are separated. Luke ducks into a doorway and finds Rik and Dani. Rik asks for Luke's help in finding Chihdo. As Luke follows Rik, Lando, hiding, gets Luke's attention and declares he found Han. He leads Luke to two men carrying a metal storage block that looks like the one Han was stored in after he was frozen. Luke contacts the Falcon to tell them they found Han and they chase after the pair with the storage block. When they finally catch up, they learn the storage block holds Chihdo, not Han, and Bossk and IG-88's men have them surrounded. The next issue, Fool's Bounty, starts with Rik and Dani attacking the bounty hunters' men, but IG-88 summons reinforcements, forcing Rik and Luke escape. In the meantime, Chewbacca and R2-D2 have left the Falcon. Lando and Dani are taken to Drebble and manage to escape. Unfortunately, they escape into the clutches of Bossk and IG-88 who plan to test a carbonite freezing chamber on them. Rik is also captured. Luke saves them and a firefight breaks out. Chewbacca enters the fray, backed up by Stenaxes and they defeat the bounty hunters and their men. Luke, Lando, and Chewbacca leave Stenos on the Falcon, disappointed they did not find Han. With issue #72 our heroes search for Han Solo ends. Presumably, none of the bounty hunters were in league with Boba Fett. It is mentioned several times in subsequent issues that the Rebellion is continuing the search for Han while our heroes spend their remaining time until Han's return in issue #81 looking for the Rebel Tay Vanis. 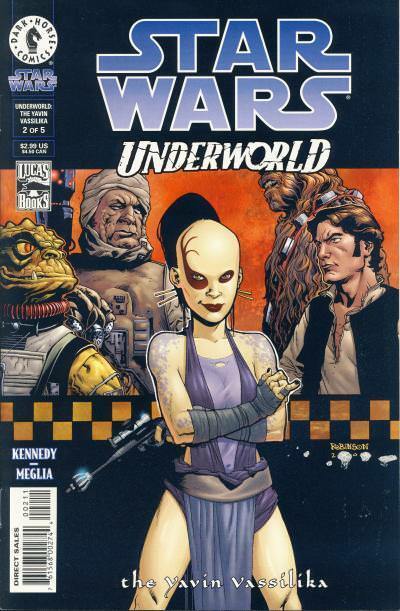 Star Wars: Underworld - The Yavin Vassilika is a 5-issue mini-series from Dark Horse. Three Hutts, Jabba, Malta, and Embra, are tricked into a competition to find the Yavin Vassilika, a legendary treasure. Jozzel Moffet, the handmaid to Malta, suggests the competition and rules are set that each Hutt is allowed only three contractors. Jabba hires the smuggler Han Solo, the gambler Lando Calrissian who is known for his treasure hunting skills, and the bounty hunter Boba Fett. Malta hires the three bounty hunters Bossk, Dengar, and IG-88 and Embra does the same by hiring Zuckass, 4-LOM, and Sardu Sallowe. It is clear from the beginning that Jozzel is scheming to get the Yavin Vassilika for herself. The story is full of many twists and turns as would be expected of the heist genre. Like all good heist stories, the competition is just the catalyst for a larger plot which ultimately involves the Rebel Alliance led by Jan Dodonna. It turns out the Yavin Vassilika contains a key to the Massassi Temples on Yavin 4 and Jozzel's plan was to steal the Vassilika and deliver it to the Rebellion. 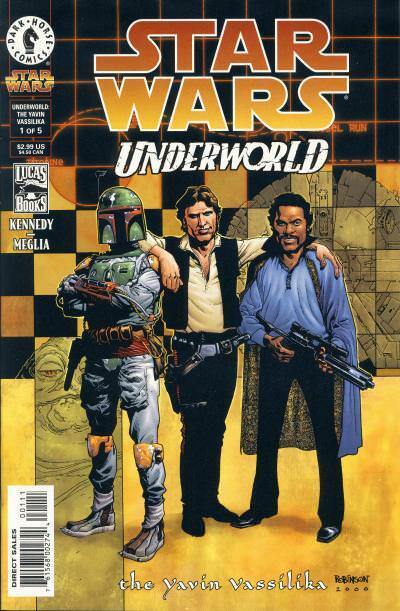 The cover for the first issue shows Han, Lando, and Boba Fett standing as if they are all friends. While Malta and Embra's teams are working together from the beginning, Not all of Jabba's hires are aware of each other. Issue #2 has a cover showing Dengar and Bossk on one side and Han and Chewbacca on the other. In the middle is Jozzel. This is symbolic of Jozzel's exploitation of the different teams in her attempt to get the Vassilika. 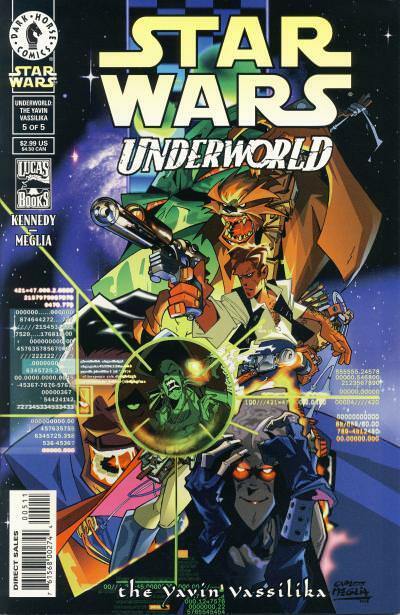 In the third issue, the teams find themselves on the water planet Mon Calamari. The cover shows Boba Fett, Bossk, and Dengar together in the background, but in the story, Bossk and Dengar are working together and Boba Fett is alone. 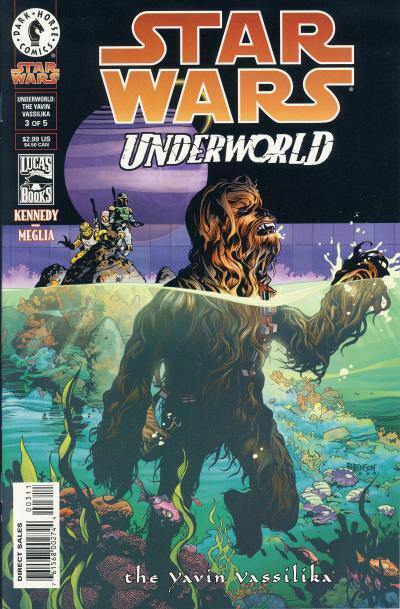 Chewbacca does end up in the water as this cover shows and the story perpetuates the idea that Wookiees are afraid of water. In Revenge of the Sith, the Wookiee home planet of Kashyyyk has a major battle between the Republic and the Separatist that is fought on a beach, with many Wookiees taking the fight to the droid army in the water. Early in the story, Han and Lando end up working together. In issue #4, we learn that Boba Fett is hired by Jabba the Hutt to protect Han when Fett rescues Han and Lando. The cover is symbolic of this twist in the story, but Boba Fett is not in Slave I when he rescues the pair. The first four covers are drawn by Andrew Robinson, but the fifth cover is drawn by the interior artist, Carlos Meglia. Meglia's artwork is extremely exaggerated and cartoonish and is not going to be to everyone's liking. His characters tend to be long and angular, but they are distinct and easily recognized. The spaceships and locations are drawn in a more traditional, if not simplistic, style. I will admit, when this comic was first released, I found the artwork off-putting, but have since grown to appreciate why this artist was chosen. The story is fast paced, but the artwork alone cannot convey the complexity of what is going on, so there is ample dialogue. Meglia's artwork offsets the exposition, making the story more interesting than it might have been if traditional artwork was used. Cade Skywalker is the child of Jedi Master Kol Skywalker and was being trained as a Padawan when the Jedi Academy on Ossus was attack by the Darth Krayt's Sith. His father Kol was killed in the battle and a starfighter Cade was piloting was shot down over Ossus, leaving Cade floating in space. Cade was rescued by a pirate named Rav and was befriended by another youth in Rav's crew named Jariah Syn. Cade denounced and hid his Jedi heritage and, in debt for saving him, becomes a member of Rav's crew. After some time, Cade leaves Rav's crew and captains his own ship the Mynock. His crew includes his friend Syn and a Zeltron named Deliah Blue. Star Wars: Legacy #11 is the first of a two part story Ghosts that has Cade Skywalker begin to come to terms with his legacy. Cade Skywalker has returned to the Jedi Academy on Ossus as the life he has made for himself as a pirate and bounty hunter begins to fall apart. Cade's secret of being a Jedi has been revealed to his friends and he also feels guilty for turning in a Jedi, Hosk Trey'lis, for a bounty. While high on death sticks, he is visited by the ghosts of Mara Jade and Anakin Skywalker. He is also found by several surviving Jedi Masters of the massacre on Ossus who Cade asks to resume his Jedi training. What makes Cade a fascinating character is he neither fully embraces the light or the dark. He is easily the most nuanced Jedi in Star Wars literature. His early upbringing as the son of a Skywalker has foster an innate desire on his part to do good, but the hardship he has faced made him practical about how and when he did that. Interestingly, Legacy #11 is only the 2nd cover to show this troubled Skywalker despite him arguably being the lead character in the title. Previously, he was only shown on Legacy #2. The reason for this is simple, the writers John Ostrander and Jan Duursema had put a lot of work into building a complex and rewarding look into the future of the Star Wars universe. They introduced a lot of characters and spent the necessary time setting up the state of the galaxy in the first ten issues. I know myself and many fans were disappointed when Dark Horse chose to end this title after only 50 issues; it was easy to see there was much, much more that could have been done with the situations and characters and sales did not warrant this title ending. I highly recommend this title to fans of Star Wars, despite it being a glimpse into a future that will not exist in the new continuity. Of the six bounty hunters introduced in The Empire Strikes Back, I always considered Dengar to be my least favorite. In the movie, Dengar is standing next to Boba Fett, Bossk, IG-88, 4-LOM, and Zuckass, all who are visually more appealing, so I might be not be giving Dengar a fair chance. To me, his outfit looks cobbled together; he has the chest plate of a Snowtrooper and he is wearing several pieces of Stormtrooper armor. His clothes below his armor do not look like they fit. The worst offense of all, he is a human, not an alien or a droid, wearing a turban instead of a cool helmet. Everyone knows having a cool helmet is a prerequisite to being a great bounty hunter! Surprisingly, Dengar was the first of the infamous six bounty hunters used significantly in a post-movie story, appearing in Star War #68 and 69. 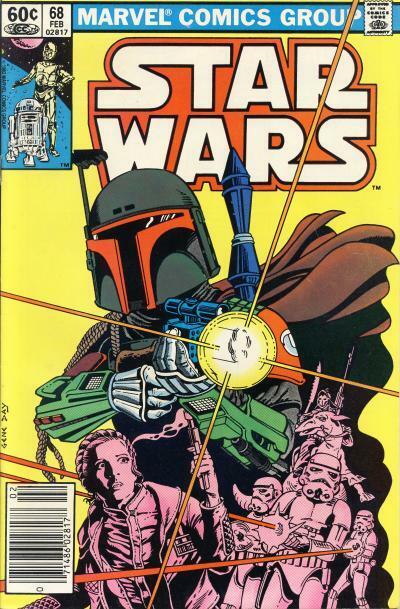 Boba Fett also appears in Star Wars #68, but only in one panel, although an argument could be made that is him on the cover instead of Fenn Shysa. I tend to believe it is Fenn. In new continuity, Boba Fett has more than a brief appearance in Darth Vader #1 and is a significant character in the first arcs in the Star Wars and Darth Vader titles. A 4-LOM like droid has a speaking part on Cymoon 1 in Star Wars #1 and the 4-LOM even shows up in a panel in Jabba's Palace in Darth Vader #1. I would not be surprised if other members of the infamous six are in the background in Jabba's Palace. But sure enough, before Bossk, IG-88, 4-LOM, or Zuckass have a decent role in a story, Dengar is used in Showdown on the Smuggler's Moon , appearing in Star Wars #10 - 12. 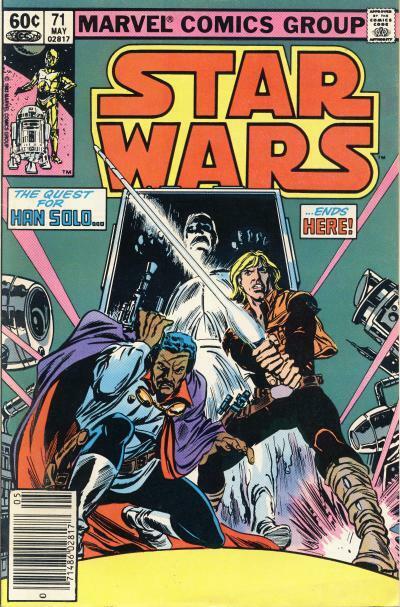 He even is shown on the cover of Star Wars #11. On the cover, Dengar is being attacked by Chewbacca. Inside the comic, Dengar, working for Jabba, subdues Chewbacca on a rooftop on Nar Shadda with a shock bolt, but C-3PO shorts it out, rendering himself immobile. Chewbacca recovers and begins fighting Dengar bare-handed. Dengar uses a concussion device on Chewbacca that injures the Wookiee. Dengar is looking for Han Solo, but he is weary of continuing the fight with Chewbacca and wants to kill him. Han shows up just in time and shoots Dengar in the back. 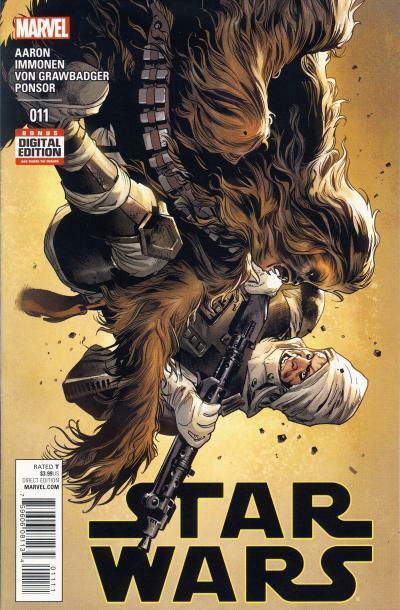 In the opening pages of Star Wars #12, Dengar recovers and threatens to use a thermal detonator when Chewbacca picks him up and tosses him off the building. Dengar falls followed by the detonator which explodes. Since this story takes place prior to The Empire Strikes Back, we know Dengar survives the encounter. Admittedly, Dengar's appearance in the story is pretty cool and he does prove to be a worthy adversary, having taken down the mighty Chewbacca. Dengar is still my least favorite character visually of the infamous six, but he does have a certain panache and I wouldn't mind seeing him show up in future stories.